Last week I mentioned that I hurt my ankle and wasn’t able to run. I wasn’t able to do my long run of eight miles yesterday because my ankle still hurts and it made me sad and reflect on where I am mentally. I have come a long way since I first started training because I actually miss running. I hope in the next couple of days my ankle will stop causing me pain and allow me to hit the ground running (pun intended). Since I haven’t been able to run, I have more time to learn what I can about the yoga practice. I have made a goal to start each day with meditation and to end each day with meditation. 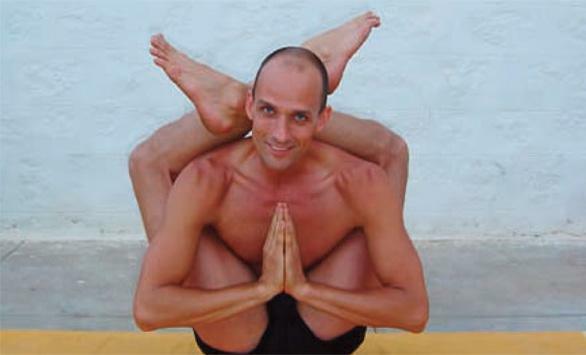 This weekend Red Earth Yoga (a local hot yoga studio in Stillwater) is hosting yogi guru Tim Feldmann (who I was told had to be reserved 2 years in advance!) and I was able to register for the Inversions, Headstands & Arm Balances workshop which I am super excited about. The others were booked completely but at least I get to attend one. I hope to learn a lot this weekend and have a feeling I won’t be disappointed. In other news, let’s talk food. 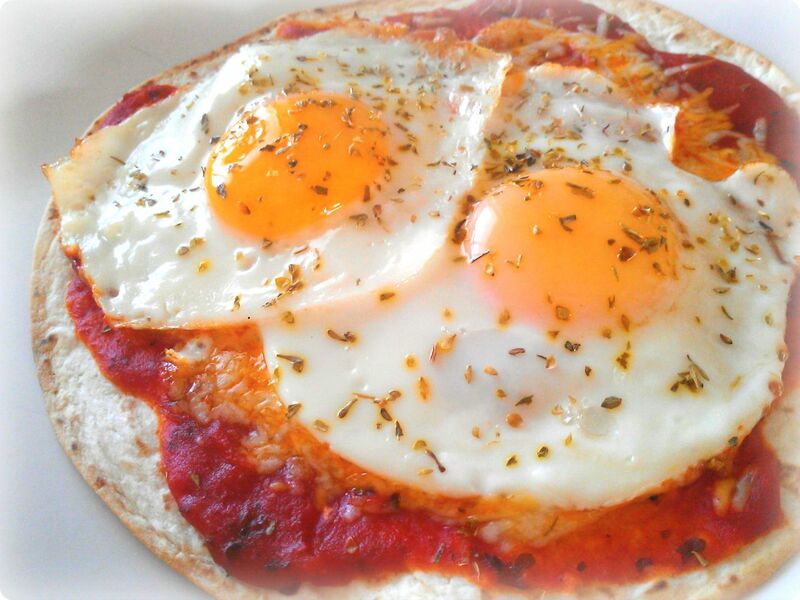 Continuing with my tortilla loving mood, today is breakfast pizza’s with a tortilla crust. So good, so breakfast of champions worthy and so simple. This is one of D-Money’s favorites and whenever I make it, his eyes light up like a child’s on Christmas morning. It’s a nice breakfast surprise because it’s like having both breakfast and dinner. I hope you give them a try and fall in love with the deliciousness. I love this recipe because of it’s simplicity but also because it’s unique. People think tortillas and think Tex-Mex foods. 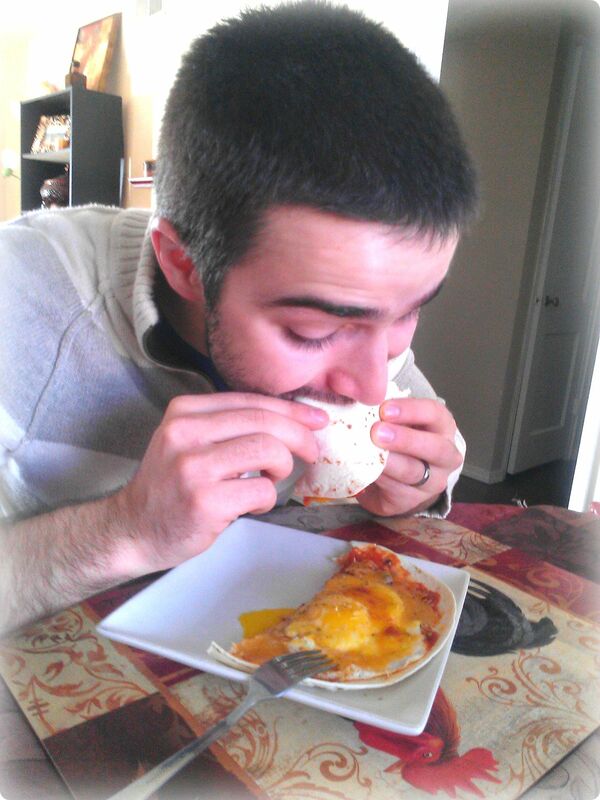 I think tortillas and think of a world of food combinations. Preheat oven to 350 degrees. Place 2 large homemade tortillas on a cookie sheet and spread a generous amount of pizza sauce over both. In a pan, cook eggs sunny side up on medium heat. I cook them until I can scoop them out with a spatula but before they are finished cooking. You don’t want to cook them completely because you are going to bake them and do not want to overcook the eggs. 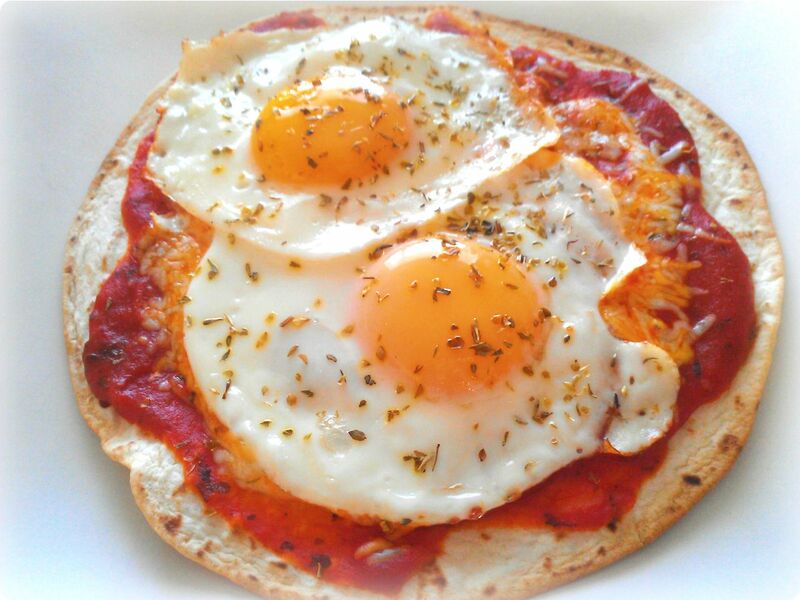 Now place the 2 eggs on each tortilla (can also place just one egg ) and sprinkle with cheese and top with oregano. 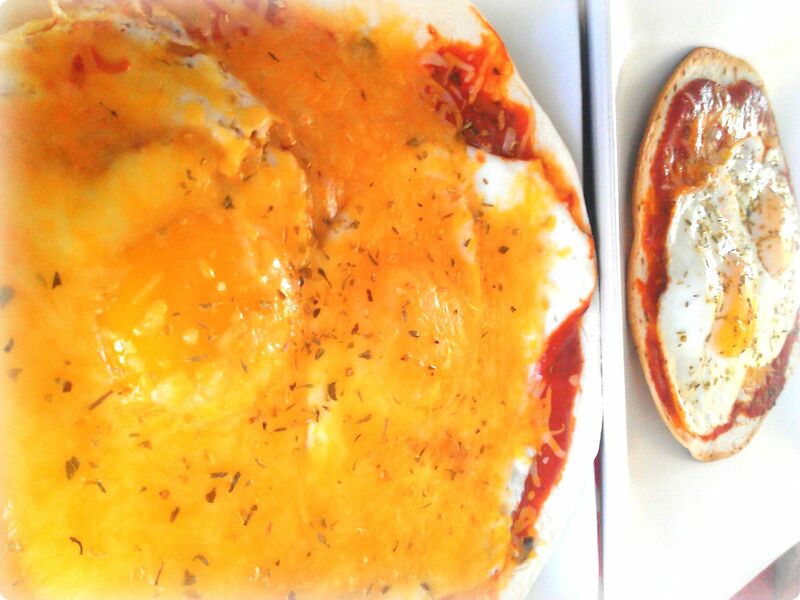 You can also follow the order of placing the cheese under the eggs and topping with oregano. Either way is delicious. Bake in the preheated oven for 7-9 minutes and enjoy! 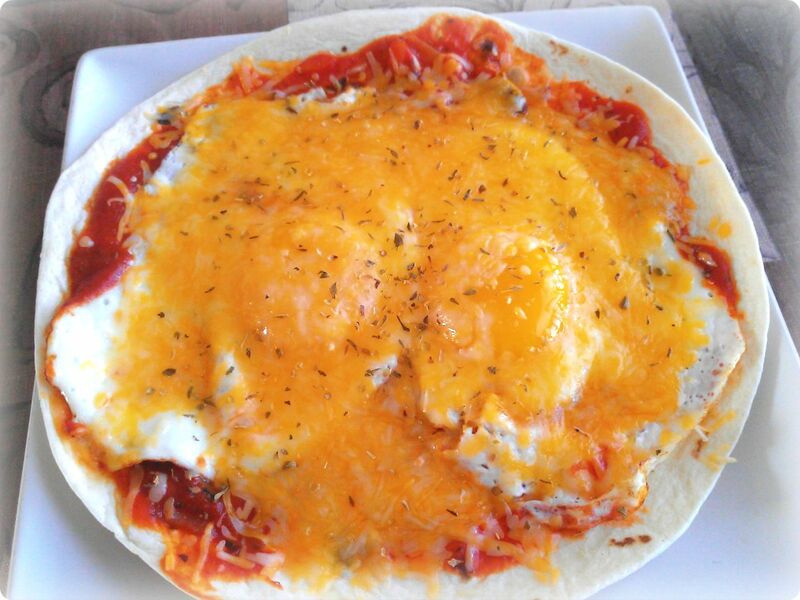 Cheese under the eggs. Yummy! Cheese over the eggs. Yummy! Next postmyhotboxkitchen is on facebook! That pizza you linked looks amazing! And thanks! I am over resting it and am ready to run… but patience is key I guess. Hope your ankle heals soon! I am in the same boat- fractured fibula and I was training for my first half marathon, it can be hard to be sidelined… but I have tried to focus on what I can still do (meditation 😉 and getting crafty on pintrest! 😛 Those pizzas look yummy btw! Oh no! I am sorry to hear about your fractured fibula and hope you are feeling better. Getting crafty on pinterest is always fun though! And thank you, I really hope it heals soon as well because I miss running. Thankfully the weather hasn’t been too nice so it’s been a little easier to stay inside. Sorry about your ankle.. I’m going to try this pizza thingy out.. Get well soon!!!! Yay for snow days! Let me know how you like them. I have been experimenting with corn tortillas but am having a difficult time perfecting them. I plan on asking my grandmother in two weeks when I see her for her recipe and will share.